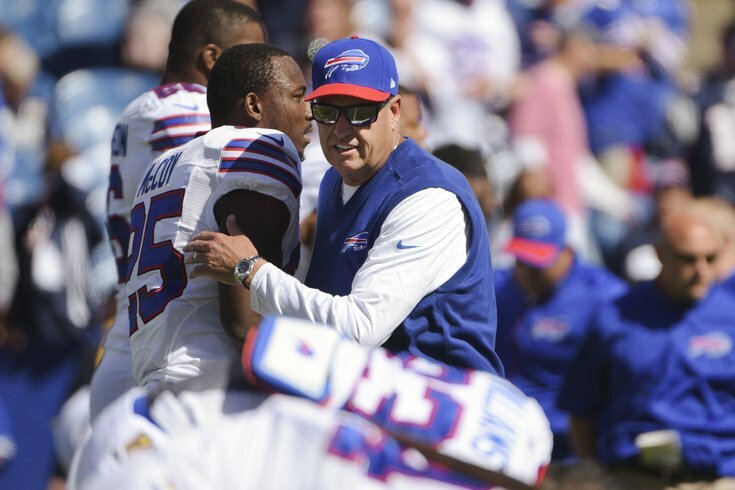 LeSean McCoy, presumably telling Rex Ryan that his father, Buddy, was a much better coach than the guy the Eagles have now. We do it every week, and this is no exception. Here are five over/unders for the Philadelphia Eagles' Week 14 matchup against LeSean McCoy and the Buffalo Bills. That's the current total being offered at topbet.eu, and on its face that seems like it's right about where it should be. However, the Eagles offense has only managed to score a total of 45 points over its last three games combined. And you certainly can't count on three non-offensive touchdowns every week. Still, both these teams rank in the top half of the league in scoring. Although the offense hasn't been clicking for the Eagles -- not to mention that Jordan Matthews (back) has suddenly been added to the injury report as questionable -- their games have hit the over four of the last five weeks, with a weekly average of 56.6 total points. The lone exception came in their 20-19 loss to the Dolphins, and in the other four games, the Eagles and their opponents combined for an average of 61 points. The Bills haven't quite been keeping the same pace, as their last five games have averaged a combined total of 47 points per game. Like the Eagles, however, that's skewed by one low-scoring contest -- in this case, their 20-13 loss to the Patriots in Week 11 -- and in each of their other four games since the bye, there's been at least 49 points scored and an average 50.5 per game. When you consider that, and factor in that Jimmy Kempski and my dad both see them reaching 50 points, I'm taking the over. You may not have heard, but LeSean McCoy, the Eagles all-time leading rusher, is returning to the Linc on Sunday for the first time since being traded to Buffalo this offseason. And he's still a little upset over how it all went down. Luckily, none of that has anything to do with his performance on the field, and so it's of no use here. Let's move on to what will happen once they kick off. Against his former team, McCoy should find similar success. The Eagles have allowed their opponents to rush for at least 100 yards in five of their last six games. The only exception? The Miami Dolphins in Week 10 ... and Miami only came up a yard short. Those six games include two of 200 yards or more -- like when Doug Martin ran for 236 of the Bucs' 283 yards on the ground -- and average out to 155 yards per game. It seems like so long ago that the Eagles run defense was one of the best in the NFL, but through the first six weeks of the season, they were allowing 94 yards per game. I don't expect a dramatic turnaround from the defense this week. With Ryan Mathews likely to return after missing the last three weeks with a concussion, it's hard to imagine Murray, who has been the team's least efficient runner this season, will get more carries than the eight he got last week against the Patriots. However, Chip Kelly said this week that Murray's limited role had more to do with matchups against New England's big linebackers. If that's the case, Murray could see an improvement in his touches, but it's getting to the point where if the team can't see they have better options in the backfield, you should be worried. Over the last three weeks, Murray is averaging slightly under 12 carries per game -- all without Mathews in the lineup. In the five games prior, the former Cowboy was averaging close to 20 carries per game. I don't see him getting back to that volume of usage against the Bills. Against the Patriots, Billy Davis’ defense allowed 100 yards receiving to a single player for the first time since their Week 9 win over the Cowboys. And it wasn’t even a wide receiver, it was New England RB James White, who caught 10 passes for 115 yards and a touchdown. That may come as a surprise considering the offensive output we saw from the Bucs and Lions recently — each team threw for five TDs against the Eagles. But against receivers like Sammy Watkins, the Eagles defense has struggled. Over his last two games, Watkins has scored three times and amassed 267 receiving yards. More impressive is his yards-per-catch average in those games, which is 29.67 on nine receptions. On the season, the second-year wideout is averaging 18.1 yards per catch, good for fifth-best in the NFL. With Nolan Carroll out for the rest of the season, rookie Eric Rowe could find himself matched up against Watkins on the outside. And while Rowe, a rookie out of Texas, played well last Sunday in his first start, there was no one on the Patriots anywhere close to as skilled as Watkins. Against the Calvin Johnson of the Lions a week earlier, Rowe got beat for three touchdowns — although it’s hard to entirely fault the young corner. Because he can be so explosive deep, as well as after the catch, Watkins won’t need a ton of receptions to reach the 100-yard mark. And while the Eagles are 7th in the NFL in yards per catch allowed (11.0), they’re 25th receiving yards allowed (275.6/game) and 31st in receiving TDs allowed (28). Did you know that Bills coach Rex Ryan is the son of former Eagles coach Buddy Ryan? Oh, you did? You say that everyone knows that already? Maybe let the CBS broadcast crew know that because there's a good chance they mention it more than once.